So, it’s taking a while to actually get going in Hawai’i, but here we are on our very first morning enjoying breakfast. Something that I think makes Hawai’i more magical is that there aren’t problems with bugs like there are in places we’ve visited in the continental US, so almost every hotel and restaurant is open to the outdoors. While we were eating our breakfast there were birds walking around and a gecko climbing a column, but no wasps or flies making us uncomfortable. I saw the shaded area behind the layers as an opportunity to do some more watercolor techniques with Distress Inks and the banner along the left side was a fun place to put a film strip die cut (from Paper Issues). (I have lots of musings about this page, I apologize! I’ll get back to the pictures and techniques in a couple more paragraphs.) So another thing about Hawai’i is that while the costs are high, meals are also incredibly generous. It might have been because we were all getting over the flu which left us lacking an appetite, but every meal was just huge – it made it easy to just snack for one meal and only have two major meals a day, which is quite convenient when there’s a lot of driving and exploring going on! More details of the layout? Sure! 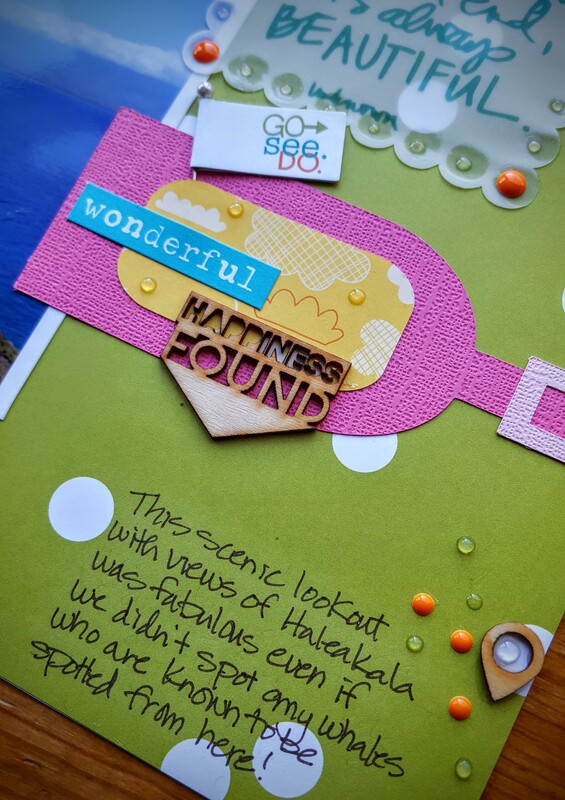 I had a blast creating this bright and fun page and am so glad to have another story of our trip documented! Thanks so much for stopping by! I hope you’ll stop in again soon! A Sketchy Plan to Scrap My Stash! Oh, hello! 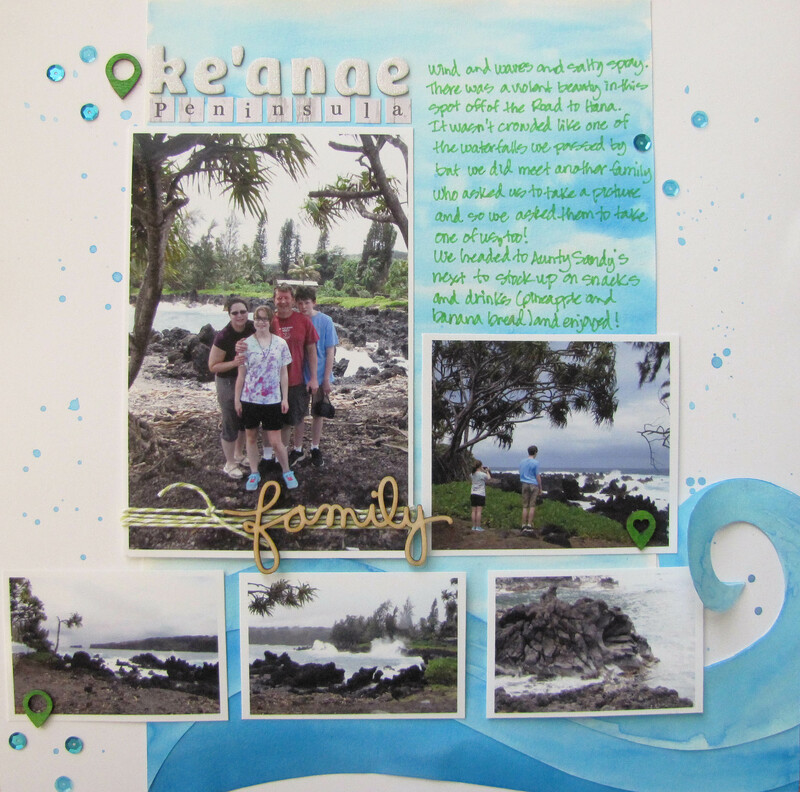 I am finally back with a scrapbook layout from our trip to Hawai’i. 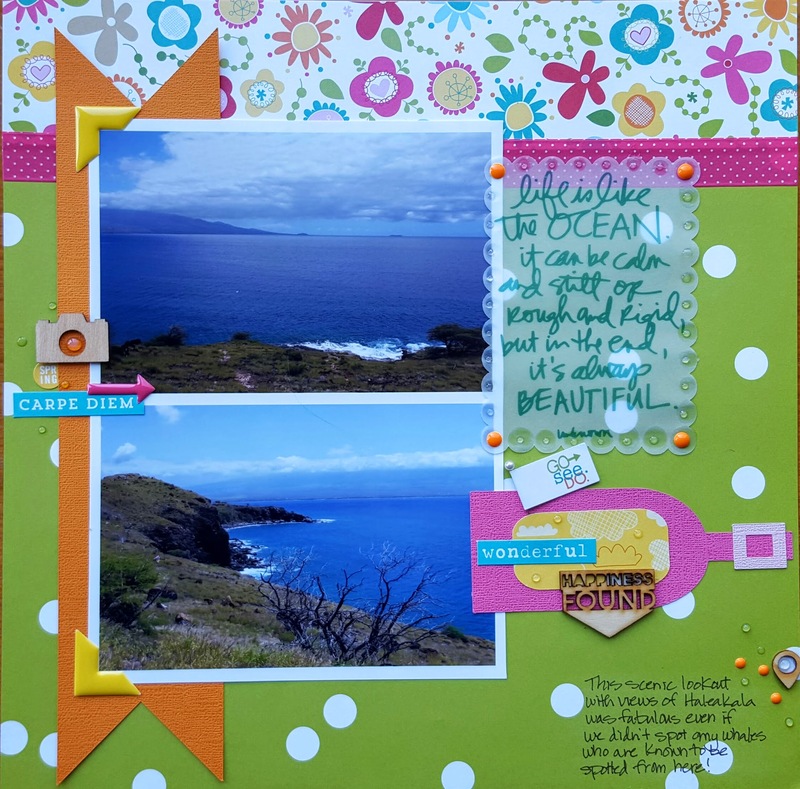 My plan is to get a minimum of one layout created each month for this trip and share it in the Scrapping Our Stash Blog Hop at the end of every month. 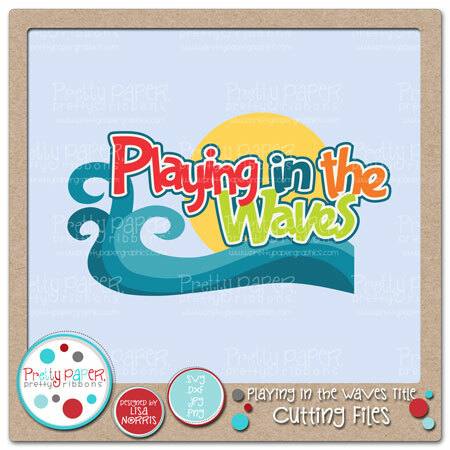 I’m using the perfectly awesome Sand & Surf collection from Bella Blvd along with a few of their other collections since they all coordinate so well! 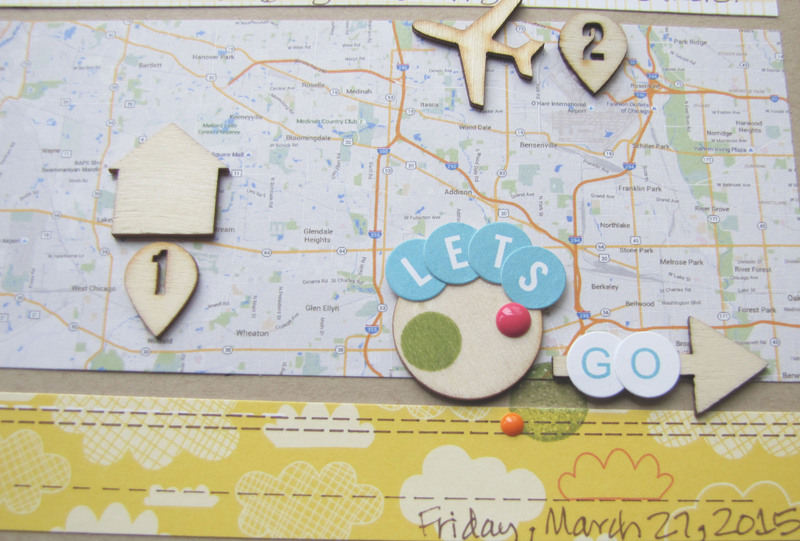 This month there weren’t enough bloggers for a hop, but I am happy to share my stash busting layout with you today anyway! 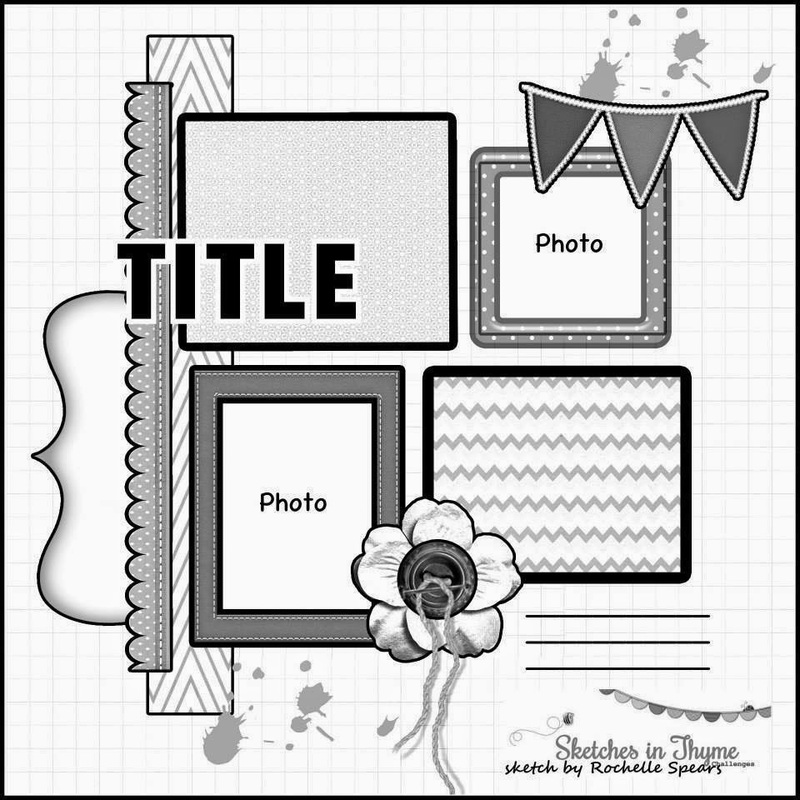 And since Simon Says Stamp’s Monday Challenge was Throwback where you could pick a previous challenge and create a project for it and they had a challenge for Make a Plan, I decided to enter this layout into that challenge since I have definite plans for scrapping this trip now. 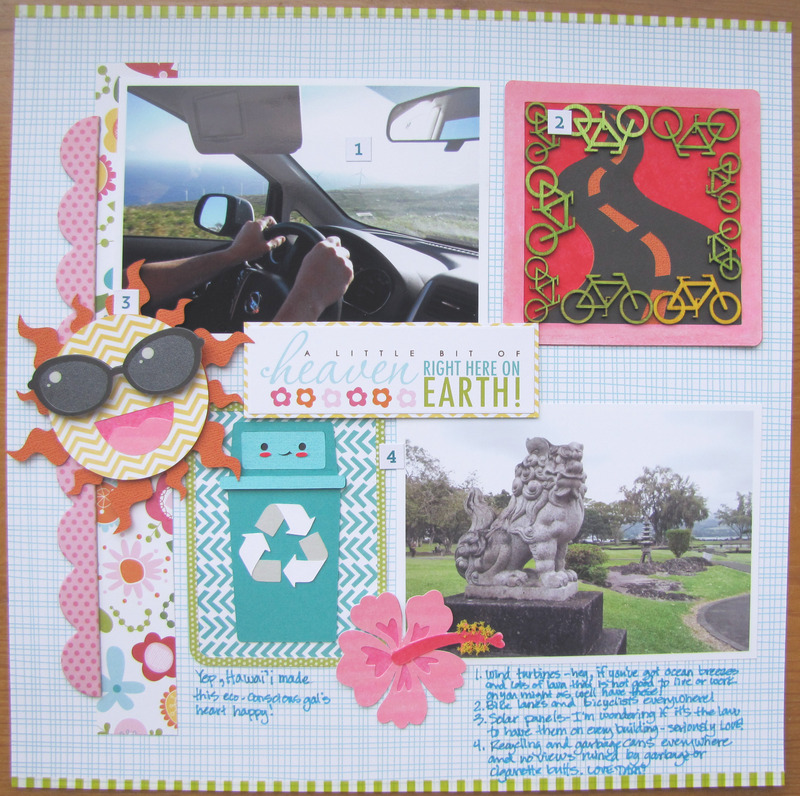 As always, Scrapbook Challenges had an awesome sketch and I loved that there were small photos (since I used my phone in the very dark stretch limo while we were on our way to the airport and the pictures weren’t fabulous) and I also was so pleased to have all that room for journaling since this is the introduction to my album about our trip to Hawai’i and there was quite a bit of backstory that I wanted to share. 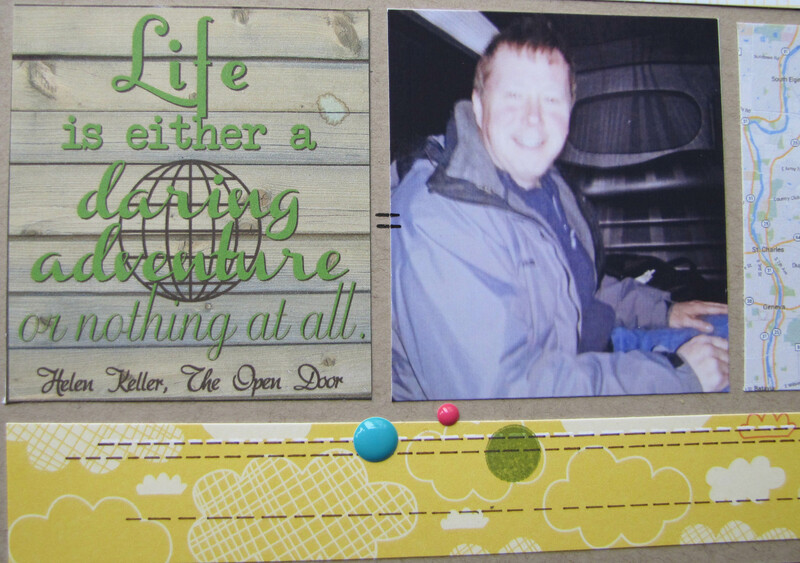 I just wanted to show off a bit of a PL style card that I created (and my cute and happy hubby;-) I really felt this quote from Helen Keller was perfect for our trip (especially heading out with both my husband and son fighting the flu.) I am signed up for Kerri Bradford’s Here, There, Everywhere class and used the ideas from Lesson 4 using Silhouette Studio to add this quote to my page. The wood pattern is from the Man, Oh Man Pattern Pack 1 from Pretty Paper, Pretty Ribbons and I used Kerri’s globe (it’s in another lesson to create it yourself, but I hadn’t done that yet, oops) and the fonts in order of appearance are FontleroyBrown, Another Typewriter, Channel Slanted 1, Biscotti, and akaDora. I’m pretty proud of how it turned out! 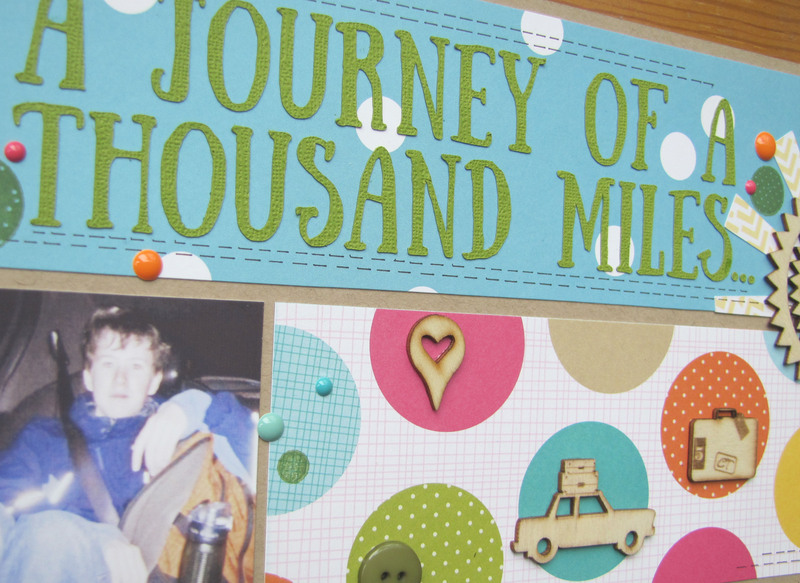 Have you ever created word art to embellish your page? It’s a nice skill to have and I will say that anyone can download the Silhouette Studio software for free and print something like this out! How’s that for enabling? So there you have it! 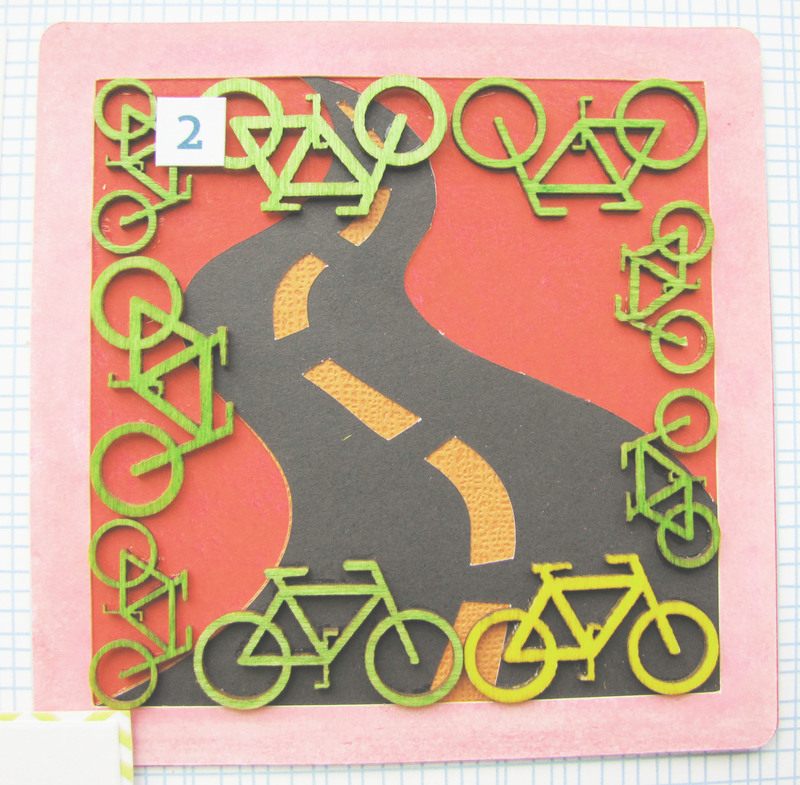 Cardstock from Bazzill and Doodlebug Design Inc., a die cut from the Silhouette store, a button from Basic Grey, Sakura Sepia pen, Xyron Mega Runner, Scotch Quick Dry Adhesive and Zig Chisel tip glue pen round out the list of supplies! Thanks for sticking through this wordy post! Sometimes I don’t think enough can be said about a moment in time and I guess this was one of those moments! Pretty Paper, Pretty Ribbons, Pretty Perfect shape! Hi! Thanks for visiting today! 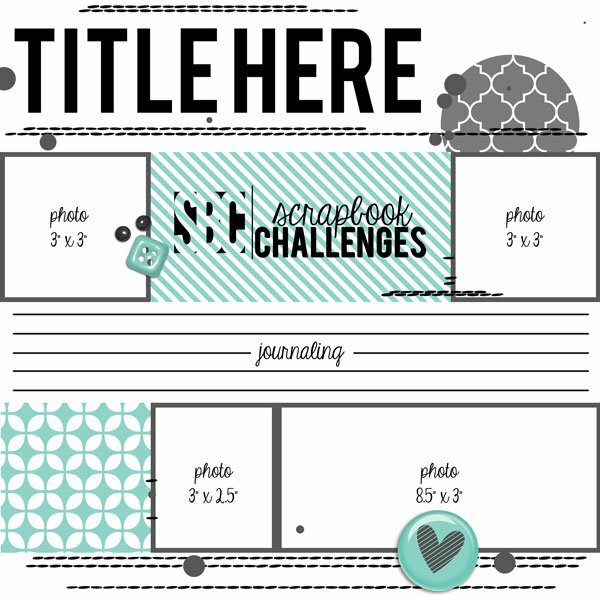 I’m sharing a project that is posted on the Pretty Paper, Pretty Ribbons blog today and I know lately I’ve been using an endless supply of files from the shop. My project today, though, uses just part of one. I was inspired by a sketch and this shape was just what I wanted to create my page! 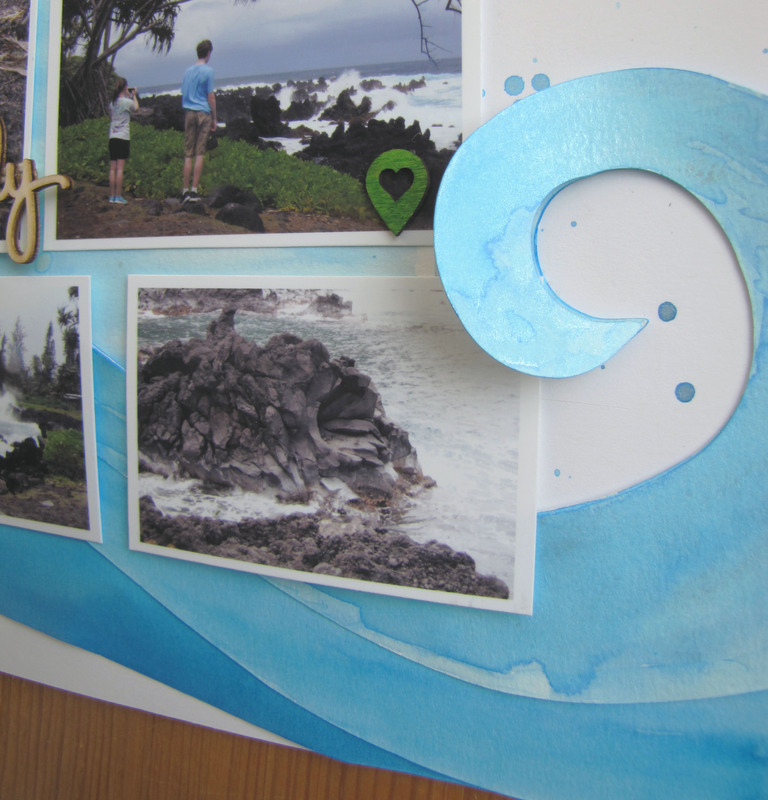 Those waves fit perfectly with my pictures from a spot in Hawai’i where the waves were crashing against the lava at the shoreline sending salty spray into the air. I decided to make the waves big and bold, like the waves in my pictures. There was so much spray that I was very glad my camera was waterproof! All I had to do was clean off the lens every once in a while and I was good to go! It was so wonderful to have the layers of the wave so I could glue down the bottom two layers and let the top curl rise up with some dimension. SCT was looking for fall themed pages, but I was so inspired by the sketch that I had to create my page about Hawai’i with it! I couldn’t be happier to have this page ready for my album. I’m usually a lot more structured about how I create pages for a vacation album, so it’ll be interesting to see how this one all comes together! Will I have the same kind of flow that I usually like? Only time will tell! I am super happy that I’m letting the inspiration drive what pages I create when, though. I feel that energy will really be a great part of this album. How do you scrap your vacations? 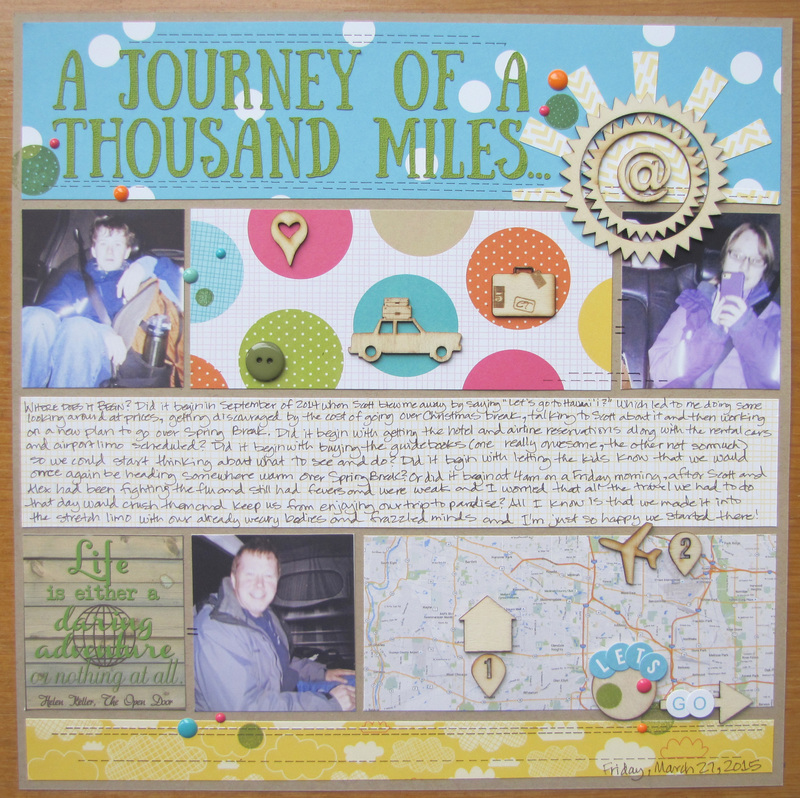 Do you usually create a separate album or do you include it with all your other pages for the year? I love creating one album for the vacation because it gives me a goal and gives those pictures a definite home that anyone can find quickly and easily. Thanks so much for stopping by! I love hearing your comments, so please leave me a few nice words below! I hope you’re going to join in on the Under the Sea challenge that we’re having right now over on the PPPR blog. 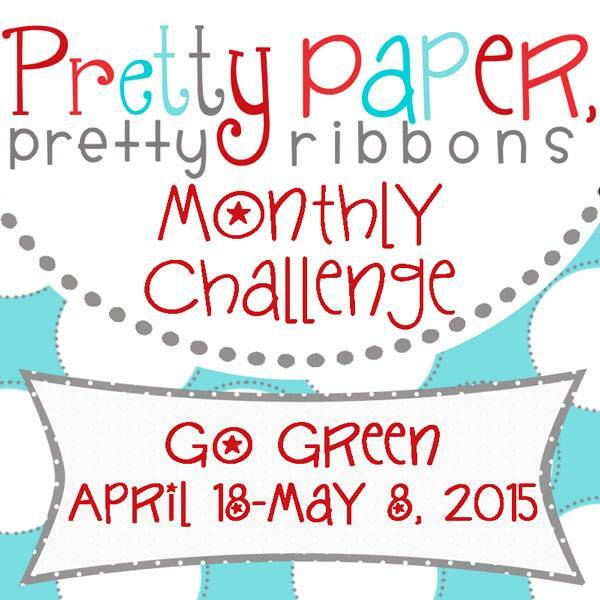 Check out all the details here: Pretty Paper, Pretty Ribbons monthly challenge. Cardstock – Bazzill; Watercolor Paper – Artist’s Loft; Watercolor medium – Ranger, Tattered Angels; Letter Stickers – American Crafts, My Mind’s Eye; Wood Veneer – Freckled Fawn, Studio Calico; Markers – Bic; Twine – The Twinery; Sequins – Doodlebug Design, Inc.; Adhesive – ScrapPerfect, Xyron. ETA: I forgot to link this up to the Lasting Memories challenge #248 Together. This is the only picture I have of all four of us together on our vacation and I’m so happy to have it on this layout! Thanks so much for stopping by today! If you came here from Lisa’s blog, you are in the right place. If you just stumbled upon this post and would like to start from the beginning, please visit the Pretty Paper, Pretty Ribbons blog. 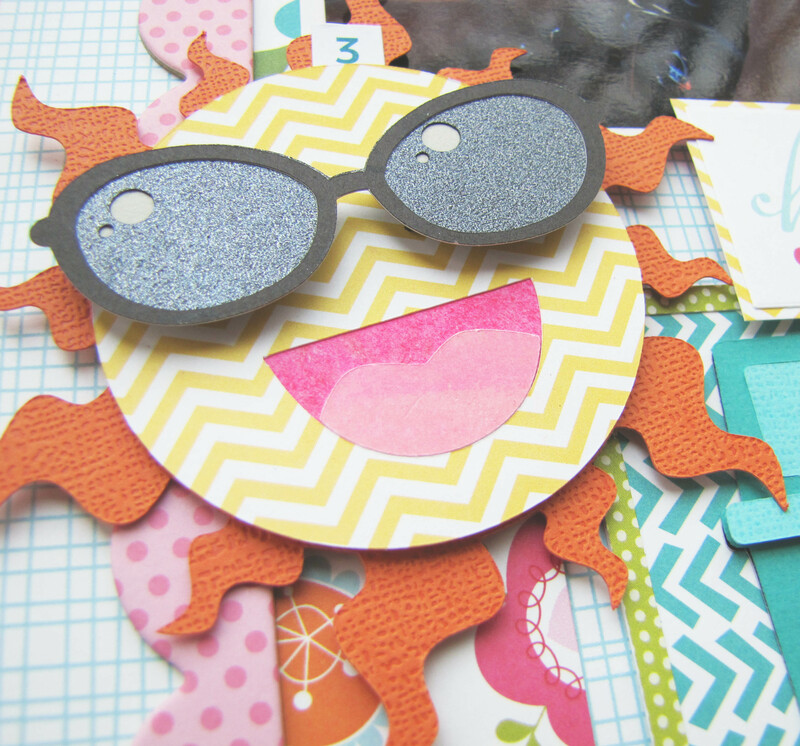 For the super fun sun, I used Cool Sun Cutting Files. He looks pretty awesome with dimension from the rays to the face and then from the face to the sunglasses. Don’t you think? 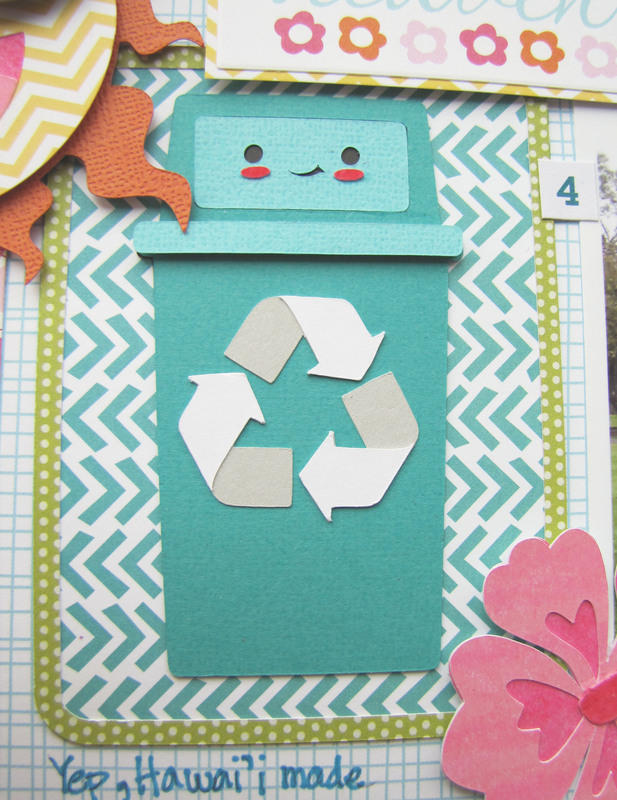 I used the new and awesome Reduce Reuse Recycle Cutting Files because recycling makes me so happy! Added some dimension to the band going around the lid. I also went with a general recycling symbol rather than specific. I love the details in the arrows with the gray layer! 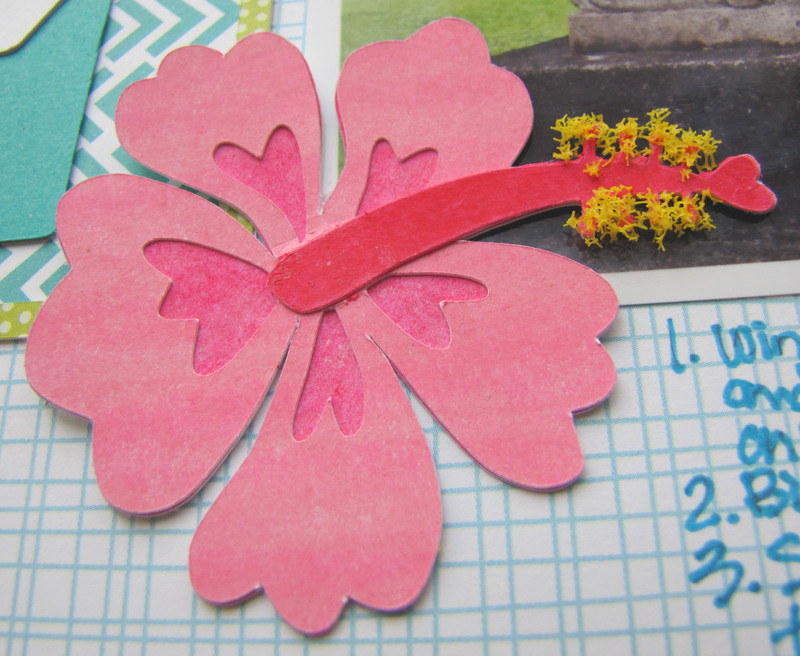 And I used the hibiscus from the Aloha Cutting Files which is so pretty! I used gelatos to color the pink/red die cuts on my page and Flower Soft to give the hibiscus a little dimension and detail. Thanks so much for checking out my page! The blog candy for this hop is a $15 GC to the PPPR store. For a chance to win, you must be a follower of each blog and leave a comment on each blog. For extra chances, you can also “LIKE” Pretty Paper, Pretty Ribbons on Facebook and/or sign up for the Pretty Paper, Pretty Ribbons Newsletter. A random winner will be chosen for the prize on Tuesday, April 21, 2015. Don’t forget to pick up the Blog Hop freebie on Saturday and Sunday of the hop, only…after that it will be available for sale in the store. I just LOVE that and try very hard to live it! Our hop is to hopefully inspire you for the new PPPR Go Green Challenge. 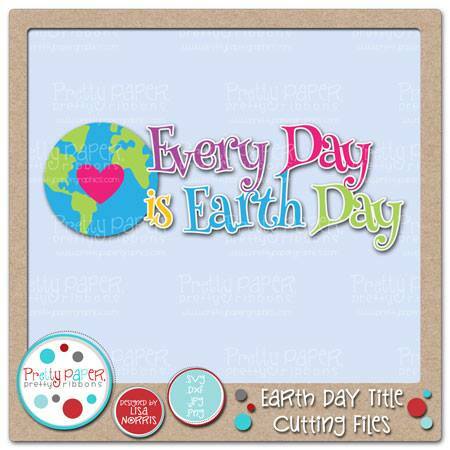 The projects can be anything that are nature or conservation themed and that feature Pretty Paper, Pretty Ribbons files. Please check here for the rules and to enter. One random participant will win $20 to PPPR. Sarah‘s blog the next stop on the hop. Click here to head to her blog! Thanks so much for stopping by! I’d love to hear about something that makes you happy when it comes to taking care of the planet! Awesome, right? That’s what I thought! The materials I used that I didn’t reveal in my post were: Cardstock – Closet to My Heart, Doodlebug, Paper Studio, and Recollections; Patterned paper, chipboard sticker, cardstock sticker, washi tape – Bella Blvd; Wood veneer – Studio Calico; Number Stickers – My Mind’s Eye; Markers – Bic; Adhesive – ScrapPerfect, Xyron, Zig.